Hi there! Today’s post is about Boots Time Delay Deep Cleansing Facial Exfoliator. I found this product in a bargain bin at my local Boots store – and it was £3 only (it’s 100ml). I’ve used Time Delay products before, and I did like them, and that was pretty much why I picked up this basic looking product. Alrighty… this product promises to clarify, refresh and exfoliate skin. It also claims to make skin feel softer. Boots recommends the product be used twice daily. Using this product in the morning doesn’t work for me. This is more of a cream wash than an exfoliator, and I need a truly refreshing face wash in the morning. Having said that, I love to use this product as a gentle makeup remover. Since the product has a bit of an exfoliating effect, it dissolves and removes makeup with ease, so I am very happy to use it once daily. Whilst this product didn’t really live up to its promise, I’m glad that it serves me well. And I also like the fragrance (similar to the scent of Gliss shampoos), so I have no reason to complain really. Hi there! Today’s post is about Tesco Pro Formula Fresh Skin Brightening Foaming Face Wash With Grapefruit & Cranberry. This face wash contains salicylic acid, vitamin c, and grapefruit and cranberry extracts. It promises to remove dirt, oil and impurities with ease, and to prevent spots and imperfections from forming. I’ve been using this product on and off for a few weeks now, and I’m happy with it. This face wash is gentle on the skin, but it’s actually quite powerful. I can feel that it cleanses my skin properly without making it feel stripped. It even removes make-up with ease! This is truly great! Whilst I don’t think that this face wash has any visible brightening effect, I’m happy with its overall performance and I would recommend it. Tesco Pro Formula Fresh Skin Brightening Foaming Face Wash With Grapefruit & Cranberry is available as 150ml for £3. Hi there! 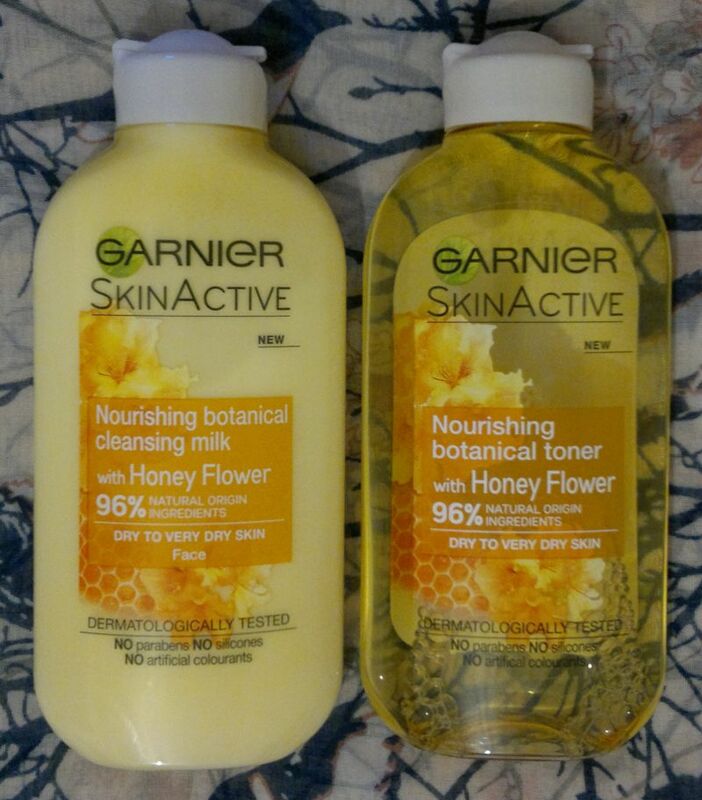 Today’s post is about Garnier Skin Active Nourishing Botanical Cleansing Milk and Toner with Honey Flower. These 2 products are aimed at people with dry to very dry skin. Garnier Skin Active Nourishing Botanical Cleansing Milk is meant to be used with a cotton pad. It promises to remove make-up and impurities whilst leaving skin feeling nourished and comfortable. I’ve been using this cleansing milk for a few weeks now, and I’m not impressed. I don’t think the cleansing milk feels particularly nourishing. It feels like a basic cream cleanser. I’ve also noticed that it’s not effective at removing make-up. No matter how much time or effort I put into cleansing my face, this stuff doesn’t get rid of all the make-up, and it’s very visible around the eyebrows and eyelashes. It really doesn’t matter how many times I go over my eyebrows and eyelashes. This stuff just isn’t good enough. I always use a toner after a cream cleanser. And the toner I used for the first few weeks (Superdrug’s glycolic toner) still picked up a lot of make-up! The only good thing about this cleansing milk is the lovely fragrance – it’s a mix of honey and bubblegum. Delicious! But all in all, this is a disappointing product. Garnier Skin Active Nourishing Botanical Toner is similarly disappointing. I’ve only been using it for a week now (I just finished a different toner), but I’ve already noticed that it’s not great. 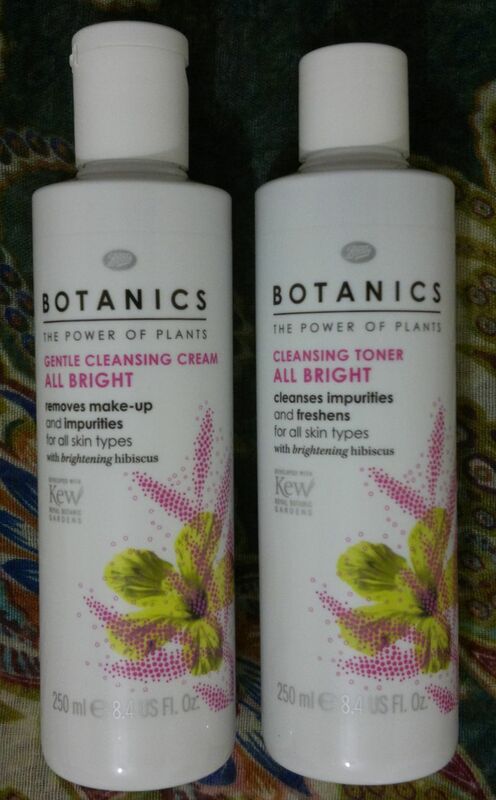 First of all, when I started to use this toner, I noticed that it didn’t catch half the leftover make-up that my previous toner picked up with ease. When I used another toner (L’Oréal’s velvety toner) after this one, I noticed that the other toner picked up a lot of the make-up residue that this one didn’t catch. I also don’t love the fragrance. Whilst the cleansing milk smells gorgeous, the toner smells like a mix of honey, sun cream and a wet towel. And there’s more! This toner doesn’t feel nourishing. The other 2 toners that I used recently were a lot more effective at removing make-up, and they made my skin feel a lot better and considerably less dry. All in all, I’m really disappointed. I will continue to use these 2 products, but I won’t be using them together. I’ll use Garnier’s cleansing milk with L’Oréal’s velvety toner, and I’ll use Garnier’s toner after I’ve cleansed my face with an effective cleanser, such as Superdrug’s brightening cleanser. Garnier Skin Active Nourishing Botanical Cleansing Milk and Toner with Honey Flower are available as 200ml each for £3.49 each. I paid £2.29 each (save 1/3 offer). Hi there! 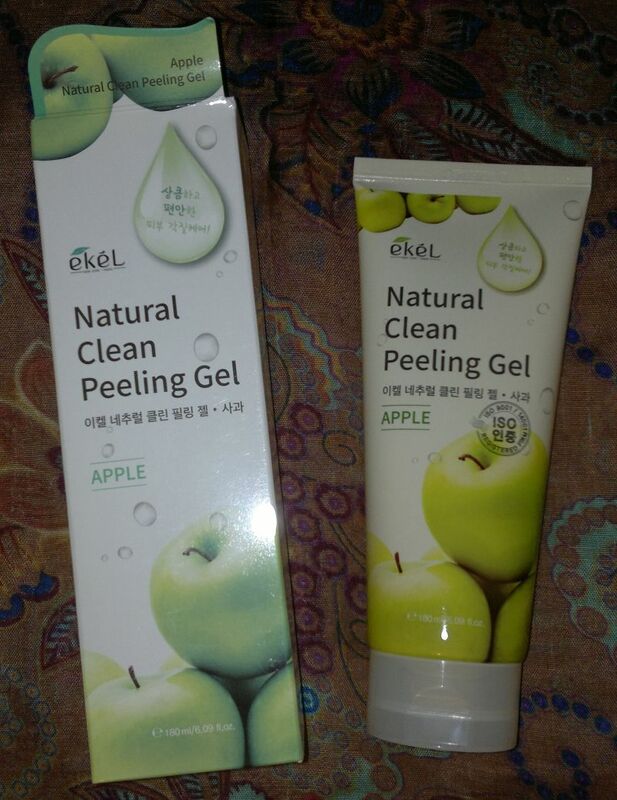 Today’s post is about Ekél‘s Natural Clean Peeling Gel with Apple. This product promises gentle exfoliation. You’re supposed to massage a small amount of product all over your cleansed and dry face. Then rinse, and that’s it! Ekél’s Apple Gel is pretty much as effective as the Grape Peel. Whilst I rub it all over my face, it balls up, thus removing make-up, dead skin cells and all sorts of gunk that clogs up pores. However, the Apple Peel doesn’t smell as yummy as the grape peel, and I’ve also noticed that the Apple Peel is a bit thinner which means it takes a bit longer for the product to be effective (=ball up). Ekél‘s Natural Clean Peeling Gel with Apple is available as 180ml. I spent £4.99 (TK Maxx).